In the Show Table dialog, click Add and the Customers table gets added to the query designer. Close the Show Table dialog. Double-click the Last Name and City fields to add them to the query design grid. In the City field, add the “Like B*” criteria, and click Run. 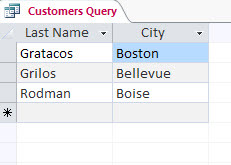 The query results show only the customers from cities names starting with the letter “B”. To learn more about using criteria, see applying criteria to a query. Open the Customers table and on the Create tab, click Query Design. Right-click the query tab, Save > Close. For more information see Access SQL: basic concepts, vocabulary, and syntax and learn more about how to edit SQL statements to sharpen query results. The following table shows types of results when the Like criterion is used with a wildcard characters in a table that might contain data with the specific matching patterns. Returns items with just two characters where the first character is E and the second is a number. Returns items with only two characters where the first character is G.
Returns items ending on 16. See more examples of wildcard characters.